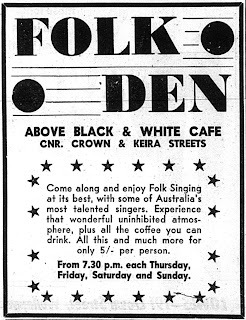 The Folk Den was a short-lived venue situated on the corner of Crown & Keira Sts operated by Kelly Sinclair-Wood and Rita Harland. 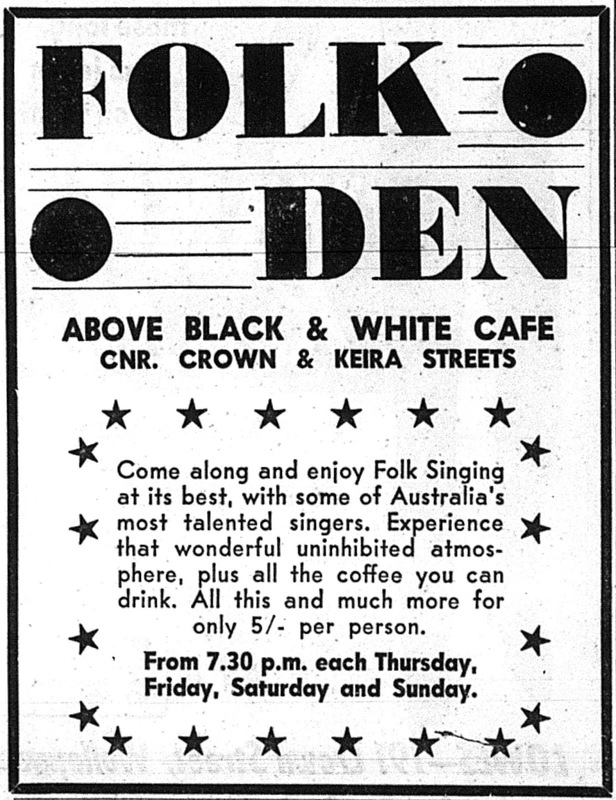 The venue opened on 17 July 1964 and sought to capitalise on the burgeoning folk scene. Sadly the doors only remained open for 3 months. Opening night saw Kiama artist Caleb Carter perform as well as Bobbie Gledhill from Sydney. The South Coast Times reported on the opening in a front-page article, noting that "customers sit on hessian on the floor, bathed in an eerie ultraviolet overhead light", with the performers playing "a great many sad songs." Former Marksmen guitarist Neil Porter remembers attending one night along with bandmate Lyle McLean, only for the pair to be embarrassed by the ultraviolet light showing the fluff they had on their jackets. "It looked really bad," recalls Porter. "I told Lyle we needed to exit and brush ourselves down. When we got outside in the normal street lights we could;t see anything! We didn't go back in, partially because it was too dark to see what the girls looked like." Reporting on it's closing, the operators told the South Coast Times that crowds had been small due the novelty wearing off and audiences traveling to similar venues in Sydney. Unfortunately, our attempts to track down the operators have been unsuccessful. If anyone has any links to Kelly or Rita, please contact us via email.